Bangkok Post, 16 April 2017: Silpaokorn University’s Prof Warangkana Nibhatsukit’s new book, “Ayutthaya History: Questions and Answers”. The book is in Thai. Most people think of the Ayutthaya period in terms of its cultural heritage, but Warangkana Nibhatsukit’s latest book highlights the economic aspect of the ancient capital. NYU Abu Dhabi has a Faculty Position open for Southeast Asian History, with a targeted appointment for September 2015. NYU Abu Dhabi is currently inviting applications for a tenured or tenure-track appointment at any level (assistant, associate, or full professor) for its History Program. Applicants should offer a special area of research and teaching dealing with any historical period concerning Southeast Asia. Interested applicants can see the job posting here. Singapore’s new history textbook will include material on the country’s archaeology, rather than start its establishment as an British colony in the 19th century. The late historian’s U Yi Sein’s writing on China-Pyu relations has been published in Myanmar. Besides the “startling” news about the origins of the human race, another stir over the history of Malaysia was raised last week when eminent Malaysian historian Professor Khoo Kay Khim declared that some of the characters and stories in Malaysia’s national historical narrative were probably mythical or did not actually exist. Among those figures was the warrior Hang Tuah and the Chinese princess Hang Li Po. Thanks to Alison for the link. Scholars, especially those in Southeast Asia, might be interested in the grants offered by the Henry Luce Foundation for Research Fellowships, Field Schools, Translation and a Summer Dissertation Seminar. More details by clicking on this link or on the image. 29 August 2007 (Jakarta Post) – If you’re in the Indonesian capital this month, do take a stop over the Jakarta History Museum to discover the history of the city in this month-long exhibition. 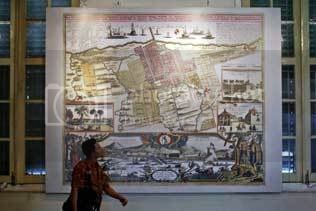 This article also gives a good overview on the history of Jakarta. Most Jakartans have only a sketchy idea of the seminal events of their city’s history, which is why the Jakarta History Museum in Kota, West Jakarta, is presenting an exhibition that helps visitors “fill in the gaps” and rediscover the past. “Many of the older people living in Jakarta come from places outside the city. They come here to work, looking for money, and go back to where they belong when they get enough,” museum head R. M. Manik said Tuesday after the exhibition opening. “That’s why so few Jakartans have more than a fleeting impression of the capital’s history,” he said. 18 July 2007 (The Brunei Times) – Literature on the ancient history of Myanmar (Burma) is scant, but this article from the Brunei Times should serve as a quick introduction. Myanmar has a long and complex history. Many peoples have lived in the region and the history began. The first identifiable civilisation is that of the Mon. The Mon probably began migrating into the area in about 300 BC, and their first kingdom Suwarnabhumi, was founded around the port of Thaton in about 300 BC. The Pyu arrived in Myanmar in the 7th century and established city kingdoms at Binnaka, Mongamo, Sri Ksetra, and Halingyi. During this period, Myanmar was part of an overland trade route from China to India. By 849, the Burmans had founded a powerful kingdom centered on the city of Bagan and filled the void left by the Pyu. The kingdom grew in relative isolation until the reign of Anawrahta (1044 – 77) who successfully unified all of Myanmar by defeating the Mon city of Thaton in 1057. Read more about the history of Myanmar.